Planning a business trip or vacation in London? 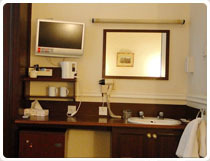 Hallam Hotel is one of the most recommended hotels in Central London for its comfortable stay & budget accommodation. We are the ideal choice of travellers who prefer spending more on leisure activities during vacation than on accommodation. Despite being a budget bed & breakfast, the staff at Hallam Hotel ensures that no compromise is with the service & hygiene aspect in the hotel. The Hallam Hotel is a budget central London Hotel with facilities especially chosen to make our guests stay comfortable and easy.�Even though, being a cheap central London hotel, we ensure that our guests get clean rooms to stay & the staff is courteous and efficient. We are a suitable hotel for both business and tourist guests alike. Our dedicated staff is at your service 24 hours, 12 months, and 365 days in an year. 24 Hour Reception for the safety and convenience of our guests. Hallam Hotel is an ideal stay option for business & leisure travellers who are looking cheap central London hotels that are close to must-see city destinations and Underground stations. The proximity of the hotel to these must-visit destinations in London will further save your expense on travelling-around. We hope you enjoy your stay here at the Hallam Hotel while you are in London..